Inlays, Crowns and Veneers are the three of the most common and inexpensive procedures used to deal with minor dental problems; tooth decay, bad oral hygiene or just sheer bad luck is all it takes for a tooth to crack, chip or erode. Fortunately, as long as your root (the part of the tooth inside your gums and covered in bone) is fine, fixing the crown is actually a fairly simple procedure, which not only prevents further deterioration but also enhances the attractiveness of your smile. Every case is unique, as such, here in Los Algodones our first step is to have an initial consultation where we can diagnose your situation, and from that recommend the best treatment for your particular needs. An inlay is a filling bonded into place to fill a tooth and protect it from further damage, think of as covering a crack on a wall with cement. The process involves two sessions, since the inlay has to be custom made, on the first appointment the consultant takes an impression of the tooth and fills it with a temporary inlay, which is later removed and replaced on the second appointment with the permanent inlay. While inlays are done in a myriad of materials (such as gold and composite resin) lately the most commonly used material by far is porcelain since its extremely durable and natural looking. A veneer is a thin veil of porcelain placed over the tooth to give it an extra layer of protection, you can think of it as getting a new paint job for your teeth. While it may seem like nothing out of the extraordinary, once the porcelain solidifies it becomes extremely durable, making the perfect solution for tooth that have lost the enamel, it can also be used on darkened teeth, or to even fix minor misalignments. If an inlay is used to fill a hole in a tooth, the crown is a cover or restoration made to replace a missing portion of a tooth. While it can be used for cosmetic reasons, it is in fact most commonly used to mend a tooth that’s far to damaged. A decayed, fractured or hollow tooth can easily crumble from the pressure exerted by a bite, as such; the crown is placed to protect the remaining structure. 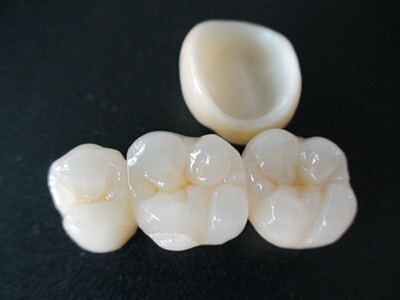 Just like inlays, crowns can be made from a plethora of materials, but porcelain is by far the most natural looking choice, while also being one of the most durable materials out there. As you can see, most of these procedure are extremely simple, and very durable, you won’t even have to change your dietary needs, just keep a good oral hygiene and do your regular check up to keep that wonderful smile.